Today i would like to share with you a cover that I received from the United States recently. What is interesting about this cover is that 4 of the stamps used were issued at least 60 years ago! I was amazed and curious to find out why the sender chose to use vintage stamps on mails rather then keeping them. I did some research and here are my findings. It began in the 1860s and 1870s where children and teenagers were the early collectors of stamps. And many adults dismissed it as a childish pursuit. It was not until the 1920s that publicity about valuable stamps encouraged a large increase in the number of stamp collectors. This rapid increase in postage stamps values was largely because very few of the older stamps were being saved in good condition. Especially difficult to find were pairs, triples, and large blocks of older stamps. Because many U.S. stamp issues of the 1920s rose rapidly in value, during the 1930s many American collectors stockpiled mint U.S. stamps with the hopes of selling them for a sizeable profit in a few years’ time. This was never materialized. 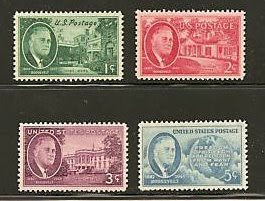 This is the Franklin D. Roosevelt Series, issued in 1945 to honor the 32nd President of the United States. 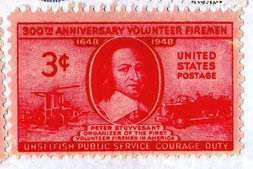 A single issue to commemorate the 300th Anniversary of volunteer firemen in 1948.